My dear friend, Steve, died last year. Steve was a hockey player. He loved jazz and among his many eccentricities, he could knit. And not just simple stuff, he could knit sweaters, with hoods. Steve had just started to run before he got sick. He ran his first 10k and we were making plans to run a half marathon together, but sadly, that never happened. For the 20+ years that I knew Steve I always thought that, someday, I’d like to learn to knit. A month ago, I started learning to knit. It’s an odd hobby for someone with a short attention span, but then, so is distance running. It’s very similar to distance running, in that you do a lot of the same thing for a long time. You also spend the quality time in your head that only repetitive motion seems to encourage. Given these similarities, I guess last nights dream was inevitable. Maybe 20 or 30 people were gathering at a house. Shack might be too harsh a description, but you wouldn’t let your child rent it. These were runners, you could tell by looking at them and you could tell by all of their night before a race rituals and peculiarities. The one ritual that seemed perfectly normal, in the dream, was the attention to knitting. There was a woman that was seemingly famous for the fact that she knits, while she runs. She had brought gifts for several of the people that seemed to know her well, hats and scarves and such. The dream morphed into the race…..a road race. It really had the feel of a multi day stage race, there was a greater willingness for groups to stick together for longer periods of time than you might find in a one day race. It was very hilly, the roads were narrow and poorly maintained and the cars that were on them drove with a seemingly premeditated anarchy like in Venezuela……. or Arkansas. The knitting lady, was exactly that. She knitted and ran. Nobody seemed to think it was dangerous, or even strange. She ran in our small group for a while, but eventually that group stretched out and she ended up behind me. I couldn’t really tell, in a dream, how fast I was running, but it felt good to finish when the leaders were still hanging around the finish. The finish line was in a littered alley way. Dumpsters turned on their side and broken pallets everywhere, pretty technical. The knitting lady finished a little after I did, I couldn’t tell if her decision to stop knitting and just run was part of her kick, or if it was just necessary given the terrain. I’m about a third of the way done with the scarf I’m working on. 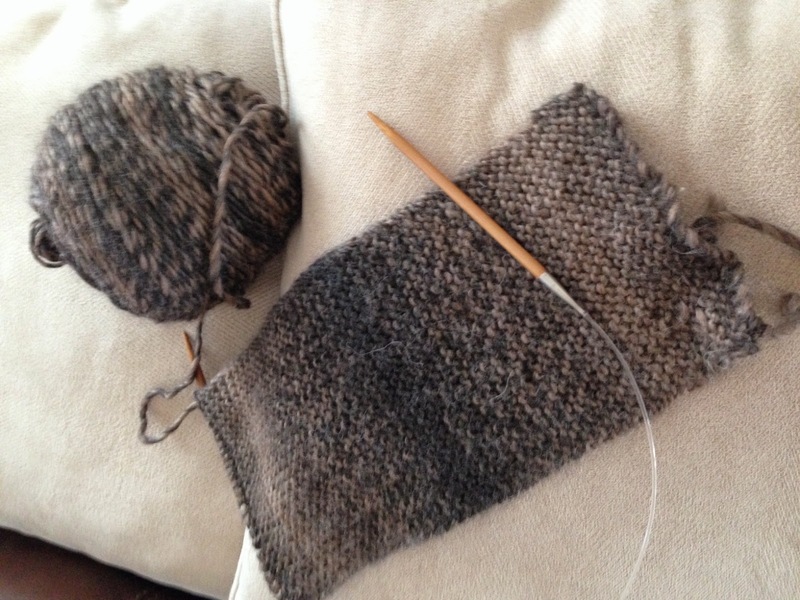 I’m already dividing knitting into thirds in my head the way I seem to divide everything, including miles. I realized a few years ago that I have a real aversion to the concept of half way, and rarely ever divide things into halves and quarters, but instead, always thirds. People often ask me what I think about when I’m running “for so long”. My standard answer has always been, “the same things I think about when I’m not running”. But, for a while, I may change that to “the same things I think about when I’m knitting”. Like, are small square plates still called saucers…..and my friend Steve.